By the end of the week, yours truly is kind of done with cooking. I need to figure out quick and easy meals, and quesadillas are a good solution to that problem. 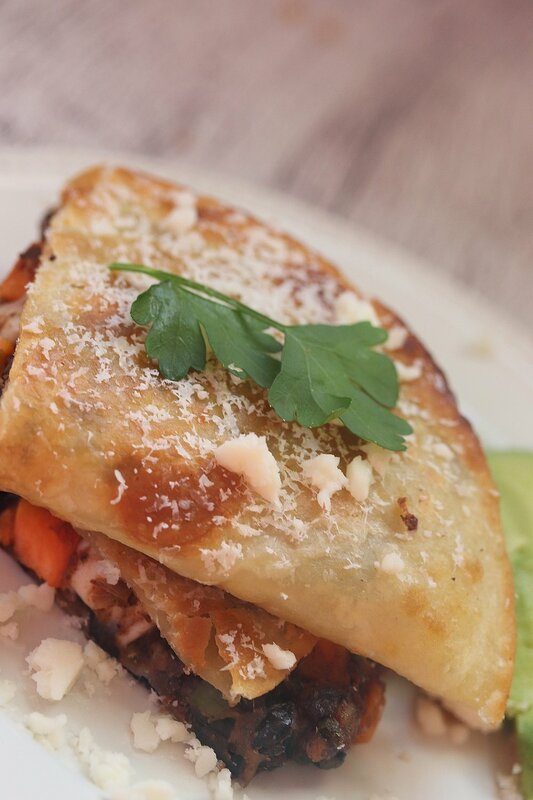 While our go to is typically beef and cheese, these black bean and sweet potato quesadillas sure do hit the spot. Great for a weeknight or weekend, and a great alternative to a meat dish. Preheat oven to 250 degrees. Line a baking sheet with parchment and place in the oven. In a large pan over medium heat, heat some extra virgin olive oil, about a tablespoon. Once warm, lower heat to medium low and add your shallots. Allow to sweat for 3-5 minutes, making sure they don’t burn. Next add your minced garlic and diced jalapeño and allow to cook for an additional 1-2 minutes. Add a little more oil if needed and add the sweet potatoes and season with salt, pepper if desired, cumin, coriander, and chili powder. Allow the potatoes to cook, stirring occasionally, for 10 minutes. Add the drained black beans and give the whole batch a stir. Squeeze the juice of one lime over the mixture, stir, and lower the heat to low and place a lid on the pan. Let this cook for about 10 more minutes, until the sweet potatoes are al dente. Once cooked through, take a potato masher and lightly mash the mixture. Add in your diced queso blanco as well as the Mexican cheese blend. Stir to combine and set aside. Grab another medium sized pan, turn the heat to medium, and drizzle a little olive oil or cooking spray. Place a flour tortilla in the pan, and add a good amount of the sweet potato black mixture over one half of the tortilla. You may need to lower the heat a little. Flip the quesadilla and allow to get golden on both sides. Remove and place into your preheated oven. Repeat this until you have no more filling or tortillas remaining. Serve with some crumbled cotija cheese on the top and parsley.